South Amboy, Parlin Dentist Dr Mariana Blagoev announces a brand new program to celebrate Father's Day. 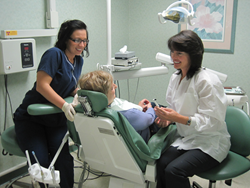 She is offering a $19 dental cleaning, exam and x-rays program to local residents. South Amboy, Parlin dentist, Dr. Mariana Blagoev has been bringing smiles to local residents for more than 20 years, beyond simply performing work as a dentist. Earlier this year, Dr. Blagoev launched a Food Drive that would give an inexpensive dental cleaning program to residents and at the same time, donated all proceeds collected to the First Presbyterian Church of South Amboy. She has also launched a "senior day" program where seniors are treated at no cost. "I would like to see more people getting healthier. Prevention is not just a better option than cure but it is a cheaper option," said Blagoev. That said, she announces a brand new program to celebrate Father's Day. Starting today, she is offering a $19 dental cleaning, exam and x-rays program that will end on June 20th. Blagoev explained, "Dental neglect is an expensive problem. We think that we can save money by skipping a trip to a dentist. We may not feel any pain, however the bacteria in our mouth accumulates and travels to the rest of our body. Most people do not realize how much we are exposing our bodies to major health issues by not taking care of dental health." According to Blagoev, heart, lungs and liver problems can result from dental health neglect. Gum diseases can create a "shut-down" of the immune system. "As a mom, my family's health is at the very top of my priority list. I wish to urge local residents -- sons and daughters, husbands and wives -- to get onto this dental program or give this program to someone you care about." said Blagoev. This "gift of health," as Blagoev would call it, is transferable to any friends or family members once it is purchased. Details can be found at her web page.